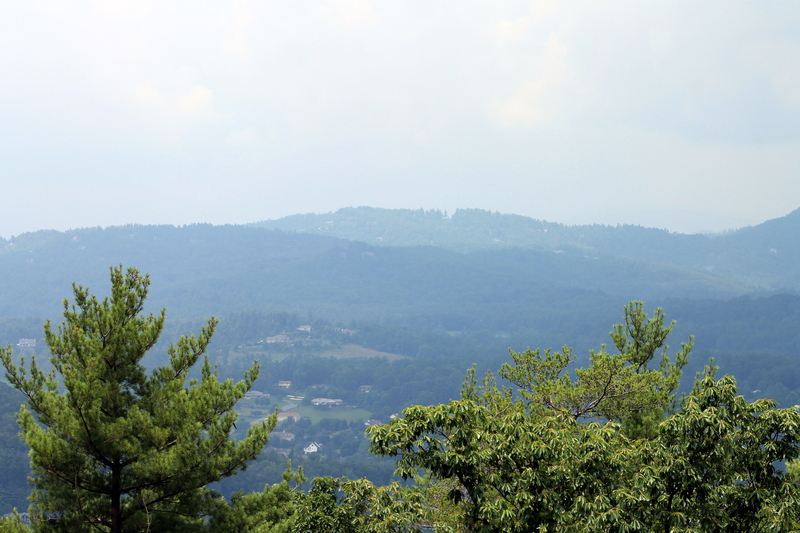 Today we decided to venture over to Flat Rock for a short hike up the Big Glassy Mountain overlooking the Carl Sandburg home. Stopping by the Fresh Market, we packed a nice lunch to eat at the top of the Mountain. The weather was warm and humid. Big Glassy Mountain is accessed via a trail system starting on the Carl Sandburg home grounds between the house and barn area; it is well maintained and marked. The face of Big Glassy is an outcropping of solid granite. In the winter, it truly looks glassy, when it becomes glazed by ice. The trail is 1.3 miles long with benches nicely spaced along the way. We took a few water breaks as the humidity had us sweating profusely. Families with children and dogs passed us occasionally, but for the most part, the trail had little traffic. It was nice to finally make it to the top and relax on the wooden bench overlooking the valley below, as a gentle breeze cooled us down. The haze of the afternoon obscured much of the view, but it was beautiful nonetheless. After enjoying our lunch and re-hydrating, we started back down the trail. A short way back down the trail, there is a small trail that exits the main trail to the right. Taking this trail for only about 50 yards, it suddenly opens up to a small rock building surrounded by a wrought iron fence with granite columns. Upon closer inspection, the house is actually a mausoleum; the windows and door are permanently rocked up. It’s one thing to come across a historic old family cemetery in the mountains of western North Carolina – they are relatively common. 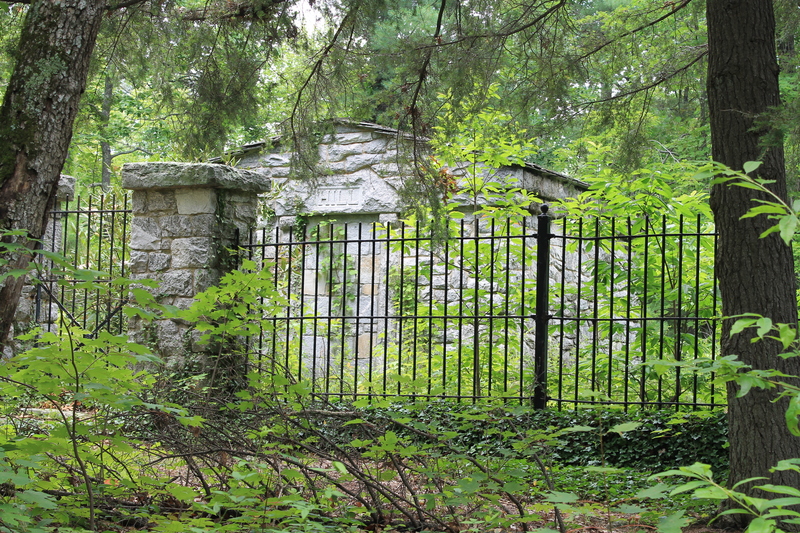 But a lone mausoleum in the woods on a mountain is a rarity, indeed. The name above the mausoleum door said “Hill”. I was able to zoom in through the fence on a plaque which gave more detail. It states: Roger Richardson Hil l, Born Saginaw, Michigan, December 13, 1882, Died El Paso, Texas, January 1, 1927. So now we have the grave of a man who was neither born nor died anywhere near the locations of his final resting place. 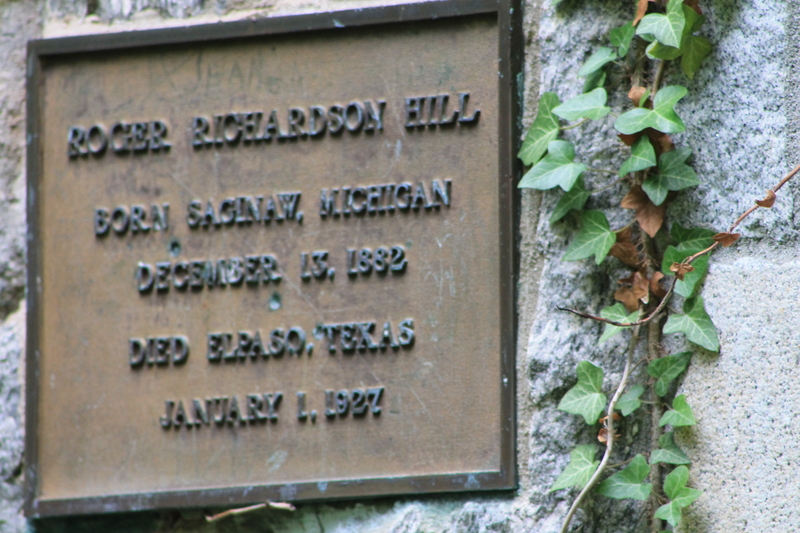 I found this to be even more interesting, so after taking additional pictures, we set home and I set out to get more information on Roger Richardson Hill. The information I was able to find was that Mr. Hill attended both University of Michigan studying Timberland and Mining and also attended Yale earning a LL.B. degree. Apparently being of poor health, he commissioned the building of his mausoleum while still alive, and asked his brother to make sure he was laid there when he died. Unfortunately, I found no information to explain how he came to Flat Rock, or more specifically, his place on Big Glassy Mountain. For a complete slideshow of our Big Glassy excursion, click here to watch our slideshow.